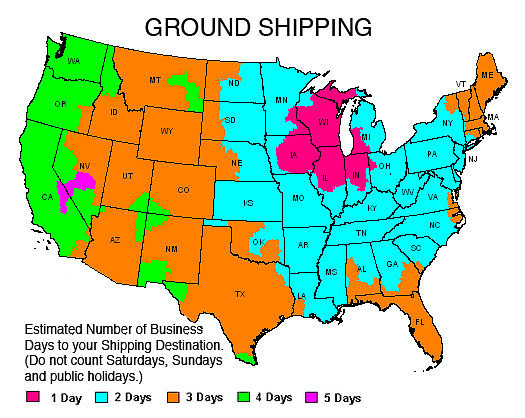 FedEx GROUND shipping takes 1-4 business days within the 48 contiguous states depending on location. For example Illinois - 1 business day; New York - 2 business days; California - 4 business days, Florida - 3 business days. Ground shipping within the 48 contiguous states by FedEx or USPS is FREE for orders over $75.00. Orders of $75.00 or less have flat rate shipping of $6.95 (A few heavier, larger or more valuable items are custom quoted). Ground shipping within the 48 contiguous states by FedEx or USPS is FREE for orders over $75.00. Orders of $75.00 or less have flat rate shipping of $6.95 with delivery in 1-5 business days according to delivery location. (Heavier, larger or more valuable items are usually custom quoted). Ground shipping to Hawaii and Alaska ($23.95-$28.95 based on item(s) weight/quantity) is by FedEx or USPS Priority Mail. (Heavier, larger or more valuable items are usually custom quoted). Next Day Shipping ($69.95) with next business day delivery within the 48 contiguous states (Hawaii and Alaska are shipped by Priority Mail). Expedited shipping for heavier, larger or more valuable items is usually custom quoted. Shipping to Canada ($44.95) is by USPS International Priority Mail. (Larger or more valuable items are usually custom quoted). Weight and Dimensions restrictions may apply - if so we will notify you before processing those orders). World wide shipping ($54.95) is by USPS International Priority Mail. (Larger or more valuable items are usually custom quoted). Weight and Dimensions restrictions may apply - if so we will notify you before processing those orders). A 20% restocking charge applies to special order or custom items. Almost all the items we offer on Mackintosh Design are stocked here at Maclin. Orders received by Midnight Central Standard Time, ship out on the next business day except for a few custom or made to order items where otherwise indicated on the item page. As soon as you place your order, you will receive an email order confirmation, followed by a second email when your order goes out with shipping details. Our Midwest location means fast delivery throughout the U.S. When you place your order to be shipped outside the United States through our secure encrypted order system, shipping worldwide is by International Airmail. Shipping to Canada is $44.95 and $54.95 to all other countries with estimated delivery in seven to fourteen days. (Please note that International Airmail final delivery is dependent on local postal services and that once the item is in your country, you will be responsible for any tariffs, customs, duties, or import fees that may apply. Weight and Dimensions restrictions may apply - if so we will notify you before processing those orders). Thanks for visiting Mackintosh Design. If you have any other questions, please email us at info@mackintoshdesign.com. We'll be happy to be of assistance.